On Thursday of last week while doing our main weekly shopping trip we ended up bringing one of the street boys home to live with us. Of course this wasn't planned, but this is Kenya and little that we plan actually happens, so no better time then right then 🙂. After doing some shopping for food items and walking out of one of our frequented supermarkets we heard "Jeff! Jeff! Jeff! ", we suddenly found ourselves surrounded by 4 or 5 street boys. These boys are the same ones who manage to find us almost every time we are in Bungoma, but I will admit that we aren't hard to find because of our light skin color. They all started telling us they wanted to go to "shule", which is school in swahili, and they were hungry. Wayne, the one we ended up bringing home, was among the boys that was begging us for help. I was excited to see him because I hadn't seen him in a couple of weeks and the first time I met him, I just knew he was supposed to be here at Mercy Children's Home. While standing outside the supermarket Jeff, Ray and myself are all looking at eachother and trying to quickly and quietly discuss bringing Wayne home. We are all in agreement so we get Nickson (mine and Jeff's driver and friend) to translate that he can come home with us, BUT no glue, he has to follow the rules, he has to go to school and if he leaves MCH he won't be allowed back. Wayne agreed and just like that he was ready to go. So happy Thursday for us right? We were able (thanks to all those who support us) to pull another "parentless" child off the streets of Bungoma, bring him home, get him cleaned up, fed and registered for school. While this was a happy moment for us it also included a heartbreaking one. While Wayne and his giant smile is trying to get on the motorbike and Ray is trying to get the bike out of the spot it is parked in, Eugene starts to get on as well. Nickson steps in and tries to explain to Eugene that he can't go today. Eugene just couldn't accept that and continued to try and get on over and over again. Jeff ended up having to hold a tearful little boy back so Ray could leave with Wayne. Eugene, Eugene, we have spent a lot of time with him. He and Dan were close and he always finds us. I will be honest and say until last month I've said "nope not that one" about Eugene many, many times. Eugene's English is minimal, his behavior can be less than desirable, his glue habit seems to be severe and his situation is complicated. We have been told by Dan that Eugene has a home that he goes to every night, just no family that really cares, so he returns to the streets to beg every day. I just couldn't see Eugene working out here, but since we brought Dan home, I've really been able to see Eugene's heart. He always asks about Dan, asked me to make a video for Dan to see and even sent a green balloon home to him. It was then I was able to see past the glue and the annoying behaviors and just see a boy who needs someone on his side. When will we go back for Eugene? Well Dan and Wayne are stable enough for us to bring home another street boy, but we are out of beds for boys. The boys dorm isn't finished yet, but Ray has graciously opened up his room to be the temporary boys dorm. Right now we have 5 boys sleeping in 4 beds in Ray's room and they are making it work. The temporary boys dorm could hold 2 more Mercy Beds, but we have an immediate need for 1 more before we can take in any more boys. The Mercy Bed (triple bunk bed) itself is costing us about $200 for materials and labor plus another $150 for the 3 mattresses. Once we have the funds to build another bed we will have the carpenter come back and get started on a bed for Eugene. What a blessing it is to know that the stories of Dan, Wayne, Abigeal, Robai, Diana, Elica, Charity and Vivian are being changed. But at the same time it is heartbreaking to personally know many whose stories are not being changed but desperately need to be. We continue to pray and trust that God will complete the good work He has started here. Thank you to all of you who are a part of changing their story, I doubt you will ever fully know the incredible impact that you are having here. Your prayers are greatly appreciated and felt. Yesterday was a total "why me?" day. Over the last few days it has been more and more in our face that we are literally living our dream. It is a crazy thing to realize that you had a desire and that God gave you the go-ahead and created a way to make it happen. It is also a huge responsibility that I don't take lightly. Several years ago I told Jeff that I wanted to have a group home for children, and today workers are diligently working to roof Mercy Children's home.But yesterday; yesterday started out like all of our days do. We got up, got ready and waited some. Most of the time in Kenya you can make plans, but the reality is that they will happen later than you planned. After morning chai we jumped on the boda boda and headed to the school in Sang'alo. Our plan was to bandage up Elijah's foot and take Chris to the Dr to get a treatment plan started. Chris is a student at the school in Sang'alo and he has some serious health issues going on. We had a precious donor send in $300 specifically for his treatment so we are tackling that and trying to get a long term treatment plan together. When we arrived at the school the children's heads were being shaved and treated for ringworm. Ringworm is pretty common here and spreads from child to child quickly. It is mostly found on their heads, the easiest way to get rid of it is to shave the head and apply the ointment all over. So instead of heading straight into Bungoma we stayed in Sang'alo for a couple of hours, gave some hair cuts, loved on some babies, spoke to a grandmother about her beautiful granddaughter coming to stay with us and ate lunch. During lunch Pastor Calistus informed us that Robai had missed a couple of days of school and had passed out. He didn't want to tell us because he said nothing could be done, because she missed a dose or 2 of her HIV meds so this is normal. So what's this "Why me?" about? Well after yesterday I was really doubting myself and honestly, God. While I know He is perfect and makes no mistakes I was feeling like maybe he did in sending me here. Who am I? Why me? In the grand scheme of things I'm nobody. I'm not qualified for this at all. I'm not a Dr., not a social worker, not a specialist of any kind...as a matter of fact I don't even consider myself book smart at all. But here I am living in Kenya with often a suffocating amount of responsibility. Often a burden so big that I just don't know how it will happen, but in my heart of hearts I just can't accept that it can't happen. I know I serve a great big God and I know that is why I can't accept that it (help/change) can't happen. Now let me give you a little snap shot of my day. This won't be a line by line of all the things that burdened me, but the ones that hurt the most. 1st "why me?" of the day...as hair cuts were being done in Sang'alo there was a little boy who was so dirty they were having a hard time cutting his hair off of his head. He had an open sore on the front of his leg that the Dr said was due to lack of hygiene. It was obvious that this child hadn't bathed in weeks. This was so sad to me, it actually made me mad a little bit...this poor little boy was filthy yet hadn't been helped by anyone. 2nd "why me?" ...As I sat in a plastic chair in the shade Pastor Calistus sat a Grandmother down right across from me asking if her granddaughter needs to come and live with us. While I couldn't understand the Swahili they were speaking I knew what was happening. Her eyes (I don't think I will forget them ever) but she said yes, that her sweet Epikai who is HIV+ needs to come and stay with us. Her situation is so dire that her Grandmother was able to make that decision on the spot. 3rd "why me?" ...being notified that Robai had passed out and apparently that is thought of as normal in her situation. In my heart of hearts I know she needed to be seen by a Dr. I'm also fairly sure she needed at least some IV fluids. Why is her situation such that if she misses a dose or two of meds she passes out? Does she need more meds? Is she on the right meds? She has constantly been on my mind and now more so. I need her home so we can dig deeper and get her healthy. 4th "why me?" of this long day...when the Dr. checked Elijah out he said he needed oral and topical antibiotics due to his foot infection and I had those for him, but he also needed to be seen by a dentist for issues with a tooth. Elijah's Mom is a widow with many children and hasn't been able to afford his medical needs. So we took him to the dentist while his Mom stayed behind and worked. Elijah had a tooth pulled yesterday without his Momma there. I'm glad that he is on the road to healing, but my heart breaks for his Mom and her situation. 5th "why me?" ...Chris; his situation is so bad. There really is no way to sugar coat it, the child is in bad condition. He has sickle cell and that hasn't been treated properly. Now he needs surgery, but right now he isn't even stable enough for surgery. His family has known since 2016 that he needs surgery, but they simply don't have the money. In Kenya the full bill has to be paid before you leave, they will not bill you later. These events left me broken, with tears in my eyes and wondering "why me?". I'm just a Momma from Texas with big dreams that everyone can be saved and helped. But can they really? My heart says save them all and my head says that's just not possible. I guess in the end on the hard days I need to remeber that I was chosen. God knows things about me that I do not. He sees strength that I'm not aware of. He knows that my heart is big enough and that I will obey Him. He did choose me and by doing so He has tremendously blessed me. I've never loved life more than I do right now. Some have asked what our biggest need is, so I thought I would answer here. The simple answer is...support. Google defines support as to "bear all or part of the weight of; hold up." We need you to bear part of the weight that is on our shoulders, walk along side us even if 9,000 miles separate us. First and foremost we need your support through prayers. We need to know that y'all care enough about our mission to call upon God for us. We need to know you are praying for the work that He has us here doing and that while we are here fighting some spiritual warfare we have people praying us through that. We need to know that y'all are praying for hearts to be prepared and softened. We need to know that y'all are praying for smooth transitions when moving a child from one home to the next. We need to know that prayers are going up for Mercy Children'sHome that is being built and so close to being completed. This home is a huge task, one that we don't take lightly and there are SO many details and decisions to be made and considered. This mission will never be accomplished by our own strength, we are depending on God and your prayers. Another way we need support is to know that we haven't been forgotten. Being 9,000 miles away and 9 hours ahead of our friends and family can be hard. We miss you everyday, even if we didn't see you often when we lived in Texas. We are now very aware of just how little (if ever again) we will see y'all. Being 9 hours ahead makes phone calls tricky sometimes, especially if work or school is involed, but we can and will make it work if you would like to talk to us. I can't explain what a quick Facebook or email message means to us, but it for sure lets us know that you haven't forgotten us. I'm not talking about a pat on our back, we aren't here for that, but just something quick letting us know you are thinking about and or praying for us. Aside from prayer, encouragement is the biggest way you can support us. I know we post a lot about the fun we have and the joy that the children bring, but some days are hard. Some days you just want to see and hug your loved ones. Some days you just really want sweet iced tea, electrical power (full time) and some air-conditioning. Some days are really hard here and you feel like a failure and wonder why God wanted to send you here. Some days you question God..."Are you sure You wanted me to go?" Living so far away from your support system can be extremely hard. So when we make posts asking for extra prayers, talking about missing family or feeling like we aren't getting enough done we need encouragement. We need scripture "shoved in our face" if you will, as a reminder. Please don't encourage us to come "home", we are home because we know that this is where God wants us. However we are human and fall short. Sometimes we just need a "kick in the pants" to get back on track! With Tammara and Ray here now I feel like often we can be that voice of reason for each other, but I try hard to be open and show both sides of this journey, because it isn't all smiles and joy. Our family is very grateful for your prayers and support! Thank you for coming along side us and helping us do what God has called us to do. 3 months in Kenya and I truly can't imagine living anywhere else. The children here really do bring so much joy, but often their situations bring heartache. My prayer is that we can help them all, even if it takes longer than my lifetime. This is a totally selfish post, but I feel like I need to reach out and ask for more specific prayers.Earlier this week I posted a photo on my Facebook of a very small pencil and yellow crayon in a 4 year old's hand. This sweet little girl attends Mercy Foundation Academy across the street from Mercy Children's Home. On that day we were just hanging out in the office at the school and she had come in to see us. She pulled out her book to show us how she could write and color. I saw her writing on the paper, but didn't see her pencil, upon further investigation I saw just how tiny her pencil was. Then she showed us how she could color...she sat her dot of a crayon on the paper and pushed it back and forth with her finger. In a very unexpected way this hit me hard. Just the day before I had seen pencils for sale for 5 cents, but yet her family couldn't afford to get her a new one. So I'm in this small room with about 15 other people and I just want to cry for her, for her situation, for her Momma who knows her daughter needs a new pencil, but can't afford to replace it. I want to cry because honestly before that moment I just assumed all the kids had what they needed for school. I can't even tell you how many pencils I have had my own kids throw away because they were "too short" and they were much longer than hers. A few days after this we met and talked to a group of street boys. During the time we were talking to them I could see the filth on their clothes, the sadness in their eyes, their shoeless feet, the glue that they are constantly inhaling to avoid feeling hunger pains and their extreme need for a loving home. If you haven't seen my post on Facebook about this you might be thinking these are all older teen boys, but you are wrong, these boys range from 7 to 13...let that sink in for a minute. 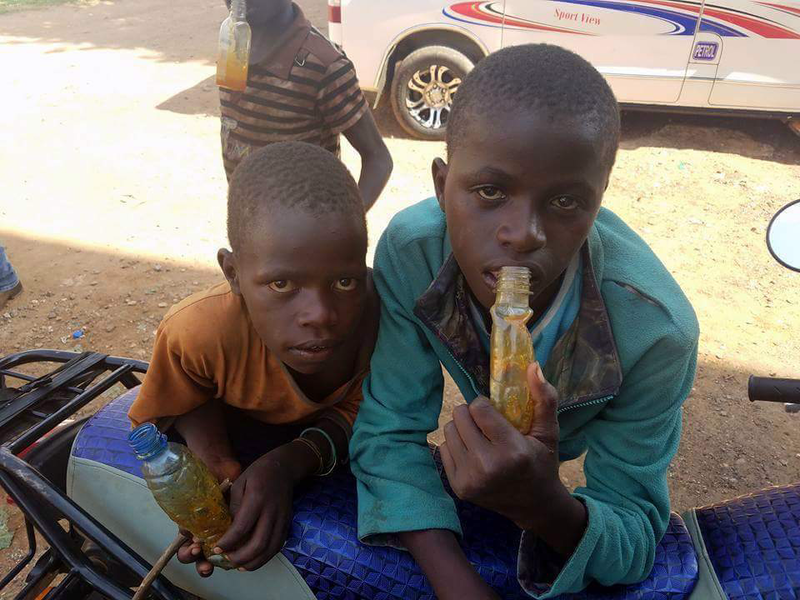 7, 8, 9 and 10 year olds living on the streets of Bungoma not knowing where their next meal will come from, not having clean clothes, not having shoes to protect their feet from the hot ground and not having a place to shower and wash the dirt off of their young bodies. Again this situation leaves me heartbroken, as a Momma leaving these boys on the street is so incredibly hard. They need a home. In a previous post we told you about Robai, a young girl who we briefly met at the youth conference in Sang'alo shortly after we moved to Kenya. Something about her just spoke to my Momma heart while we were there. I'm not sure exactly what it was, but I had snapped a few pictures of her and returned to look at them frequently. About a month later we learned from Calistus, the pastor at Sang'alo church, that she needed a home. He sent over a picture of her and I immediately said "I know her!". This week were able to return to Sang'alo, while we were there we visited the school there and were able to meet and talk with Robai and her Grandmother. Both her mother and father have passed away from AIDS, she is HIV positive, she lives with her Grandmother, Victoria, who is widowed and Victoria can't actually afford to provide proper food for Robai. While we were visiting Robai we noticed that she had some small bumps on her arms and face. 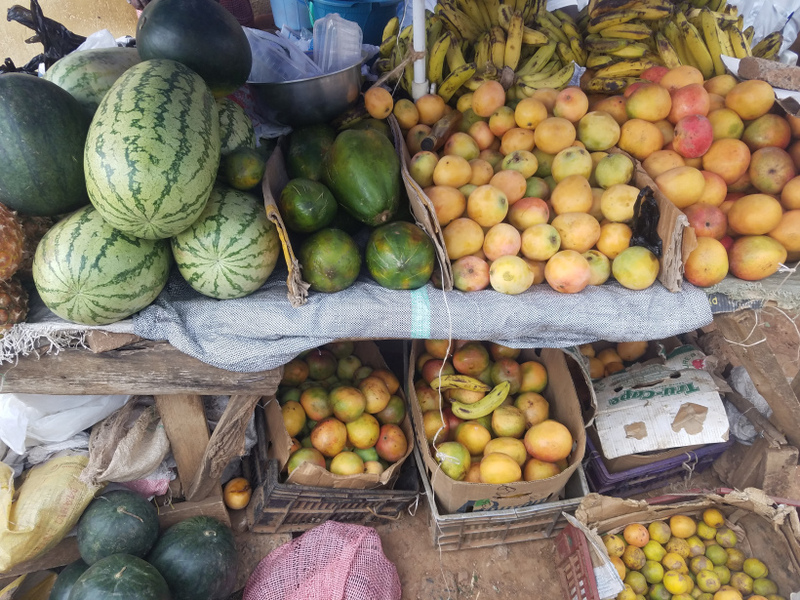 When we inquired about theses bumps we were told that because of her condition, when Robai doesn't eat fruits and vegetables every day she gets these all over her body. That absolutely broke my heart. I can't imagine being her Grandmother and knowing that Robai NEEDS fruits and veggies, but not being able to provide that for her. As we were talking to Victoria she said "if we can take this girl it would be a big blessing"...my eyes welled up with tears because that is A LOT of love to have to allow her to go and live at the children's home just so she can have her basic needs met. Robai was able to go and eat lunch with us and we able to buy her a bag of fruits and vegetables to get her through for a few days. Again I had to walk away and leave another child in a bad situation. I am so thankful that she has a house to sleep in and a loving Grandmother to love and care for her, but that just isnt enough for Robai. Sweet Robai needs to be at Mercy Children's home now, but it isn't ready for her. So how is this post selfish? I need prayers that my heart can keep taking hit after hit and still hold up. It is hard knowing that we will have a place to take in kids, but not yet because we still need a good bit of money to finish building Mercy Children's Home. It is so incredibly hard knowing that small children are sleeping on the streets, small children literally beg for scraps of food and gladly will take your leftovers. It is hard knowing that children in school are writing with pencils so small that you can't even see it once they wrap their tiny hand around it to write. Please pray that I will be patient. Deep down I know God has this and I know God didn't bring us to Bungoma to build two-thirds of an orphanage. I know that in time all the kids at Mercy Foundation Academy will have the proper supplies needed and uniforms that aren't riddled with holes and tears. Please pray for my attitude. I try to be happy and upbeat, but deep down I'm struggling with the home not being done yet. I need this home done so we can start helping these kids instead of just knowing about them. Honestly I could care less about having a home for us, this is about helping kids who need to be in a better situation. What good is it to know about all these needs without action to help fix the needs? Lastly, please pray that I will "be still and know". I need to be still and know that God has us right here with an unfinished children's home for a reason. Since we aren't fully funded for Mercy Children's Home and we are close to being able to take in orphans, it got me to thinking. I was trying to come up with a way to help others see that a little bit of American money goes farther in Kenya than it does in America. I think when some people hear that we need support to run an orphanage all they see are $ signs. So I did some math and if my calculations are correct Jeff and I have a total of 973 different friends on Facebook. If each person on our Facebook would sign up to donate $10 a month to support the orphans and widows in Kenya that would be $9730 a month! So much could be done in our community among the poorest of the poor with that kind of money! Do you know that $10 a month can and will make a difference? Do you know how many orphans and widows would be helped with that amount of money? Wow! Jeff and I have this dream that what we are calling a children's home will actually be much more than that. We hope that this home will house widows. We actually already have plans to build several rooms, apartments if you will, around the outside of the house specifically for widows. We also see this home being a place of teaching and training for pastor's and church leaders in the area. We are hoping it will become a place for others to come and see the work that God is doing here in Kenya. Come and see these beautiful smiles and take chai with them. Come and see that their lives are being changed with your help. We also plan for it to become a base of operations from which we can go out from to reach many unreached people groups in Africa. Another thing we would like to do is start a weekly meeting with the "street boys" that we often see in town. For security reasons this won't happen at the orphanage, but we would like to start a weekly Bible study with them. At this weekly meeting Jeff, Ray and one of the local pastors would take them food, teach them a little about the Bible and figure out ways to help them get off of the streets. Perhaps many of them can come to live with us. While it won't take much money to make this happen, it still requires some money and since we aren't fully funded we can't commit to this yet. My question to you is can you find $10 a month in your budget to change their story? Will you help these children that have lost one or in many cases both parents? Will you help the lady who has 4 or more children and is facing life without her husband and his income because of his death? $10 by American standards isn't much to most, but it can have a huge impact here. If you are currently donating monthly (many above $10) or have donated with one time or multiple gifts, thank you! I can't say that enough. You have no idea what it means to our family to have friends and family partner with us to help with this mission God has given us. You are helping change their story. Robai will no longer have to worry where her next meal will come from. Her grandmother will no longer lose sleep having to worry if Robai will have her school fees paid for. Did you know that 95% of your donations are going straight to helping orphans and widows? Jeff and I don't receive a salary from AFM to do this (only money sent for our living expenses) and AFM has an all volunteer staff and board. The 5% that "goes missing" from you donation is to cover book keeping and the fees to send money monthly. Here is my request, if you can find or create just $10 in your budget go to the link below right now and set up your monthly partnership. Please do it right now while this is fresh on your mind and heart. I know we are all busy people, I forget things all the time. AFM has made the donation/partnership process quick and easy for you. Thank you and God bless you! We thank God! Land has been secured and construction has begun on AFM Mercy Children's Home. After 4 days of construction, the site has been secured with a barbed-wire fence, a storage shed has been constructed for housing building supplies, a kitchen area has been built to cook for the workers, a trench has been dug around the building site for a security wall for the home, and construction of the wall has begun. So much done in just 4 days! Today, 48 men were helping build! A real blessing for so many families represented by those men. Many have nothing right now due to the dry season and so little work available. God willing, we will be able to move into the new home in about 3 weeks! Not everything will be complete by then. However, the living quarters should be far enough along at that point for us to move in. Just in time for the arrival of our dear friends the Moreno's! They too have sold everything and are partnering with us to build and run the orphanage. Moving into the orphan home in 3 weeks means we should be ready to start moving orphans into the home in about 5 weeks. That being the case, we have spent much time in prayer asking God for wisdom on how to select which orphans to take in. While the need is very great here and our goal for this year is to be able to care for 80-100 orphans, we feel it is best to start with about 10. We have also met with the pastors of the JFM churches here in Bungoma county. These are the churches that AFM partners with here in Bungoma, Kenya and have been so instrumental in helping us get to this point. These pastors, led by Bishop Kennedy Simiyu, are helping us gather information on orphans in their churches and communities they serve in order to help us prioritize the needs. This part is very tough. It is one thing to know that there are kids in the world who are struggling just to survive. It is another thing to know so many of them personally and know that you can only care for some of them. One of the children that will be coming to live with us is Robai. She is 8 years-old and is HIV positive. Both of her parents died from AIDS. She is currently living with her grandmother, Victoria, an elderly widow that recently broke her leg and her hand. Both she and Robai currently live in extreme poverty. Robai also has a brother named Boniface who ran away from Victoria's home. She believes he is living on the streets of Eldoret. We will attempt to locate him soon. These are just some of the stories that we intend to change. Steph happened to take this video of Robai at an outdoor preaching and worship event in Sang'alo before we knew she would be coming to live with us. She is dancing in the white, yellow, and brown dress. We are so very thankful for those God has led to partner with us in prayer and support. God is doing the work, we all simply obey. AFM president David Shelton, the AFM staff, the Moreno's, Juliana Tovar, JFM Bishop Kennedy, JFM pastors Godfrey, Leonard, Tobias, Calistus, Kennedy, Edwin, Evans, and Nelson, the workers building the orphanage, and so many others who are supporting this mission. We all have our part to play in this. Individually, I don't think any of us could hope to accomplish much. But together, we can accomplish great things in the Lord! Currently, we are about $900/month short on our monthly operating budget needs. Please prayerfully consider whether you would like to help us in this mission financially. We are willing to take in as many orphans as God will allow. Perhaps you can help us change their stories. If you have previously pledged to help, but have not yet set up your monthly donation, now is the time. We are 5 weeks away from taking in orphans! Please click here for more info and to donate. What kind of shoes do we need? We need shoes that are in good condition. They don't have to be new, they don't have to be a certain style, they don't have to be a brand name, they don't have to be a certain size, even adult shoes are great! The older kids here have bigger feet, so adult shoes will be put to good use. We are asking for no flip flops because they just don't hold up. I can't tell you how many single flip flops I've seen on the side of the road because they have broken and no longer work. Most Goodwill stores have kids shoes for $2.99 a pair no matter the style and usually all the kids shoes are together making it a quick shopping trip. Adult shoes there usually run $7.99 each, but adult sandals are usually $2 or $3, so affordable for most people. There are many different ways to meet the shoe needs here. 1. Collect them! Get your people involved and gather many pairs of shoes for these children. Maybe you have a small group at church, coworkers, workout buddies, a homeschool group or neighborhood friends help you collect them. 2. Drop off shoes for these shoeless feet at one of our drop off locations. One is in Rowlett, TX and one is in Fort Worth, TX. We can add more drop-off locations if needed. Email me at mrsbys03@gmail.com or message me on Facebook to arrange drop-off. 4. Share this blog and our Facebook posts with your friends and family. God can use anyone to help meet this need. There are at least 3 trips coming to Bungoma, Kenya in 2017 starting in February. The people coming are willing to bring shoes to these shoeless feet. Also, this will be a never ending need here. Please don't think that we can collect too many shoes! I hope one day to have an organization like Sole Hope involved in this area, but that isn't the case right now so we are relying on y'all. Help us spread the word and shoe MANY shoeless feet. I also did a lot of growing personally during that time. If you don't know my background, I came from an abusive home. Many times as a child I wasn't allowed to have my own feelings. I was too often told how to feel, told when to smile, and always told to get over "it". "It" was usually some form of physical pain accompanied by verbal assault. Not really something you can just get over in a matter of seconds. My whole life, in one way or another, I had been hearing "get over it" without having the proper tools on how to get over it. Something about preparing to live in the country and actually living in the country on a farm was freeing. I feel like God used that time to teach me that I had a voice. He taught me that I had choices and that I could in fact make those choices without worrying about what others would think. In the end what mattered was what God thought. That had never really occurred to me before. Most of my adult life my choices have been thoroughly questioned by others. Maybe well meaning others, but generally I walked away feeling like I was stupid for whatever they were questioning me about. When you are 21 and get married to a man seven years older than you with 3 children then go on to have 6 children and adopt a teenager, you get ALL the questions, judgment and ridicule. So before moving to the farm it never really occurred to me that I only needed to consult my husband and my God. Really it was a weight off my shoulders. I needed not to worry about what others thought about me or the road that God was leading me down. But the biggest and most important thing God taught me in 2016 was that I wasn't doing as well as I thought I was. I had this certain area in my life that I really struggled with for a while. By "struggled" I mean at one point I flat out refused to even consider doing what the Bible called me to do. Since I've gotten older and had a best friend guide me in this area I had grown a ton in the last few years. I bet if you had asked Jeff he would have even said I was doing a good job in this area. If you had asked me if I had that area down I would have said "yes". But God showed me different and even then I argued with Him. For those of you that know me you know I can be pretty hard-headed, so the fact that I argued is probably no surprise to you. In April of 2016 when Jeff was on his mission trip to Kenya God and I had a little conversation. It went something like this. Me-I really need to sleep can you please make me sleep? Him-You need to let go and submit. Him-You need to stop holding him (Jeff) back. Me-...WHAT? He's in Kenya right now, I'm not holding him back, I just keep him level-headed. Him-You need to let go and follow him. Me-But I don't want to move to Kenya. Him-You need to stop holding him back and follow him. I just wanted to sleep! My husband was 9,000 miles away, the dogs were barking, I was hearing noises, it was 4 am and I was starting to worry/freakout/panic. Instead of sleeping I was learning...learning that an area I thought I had "mastered" I was still weak in. Though I had grown leaps and bounds in that area I still needed more growth. So for the next several minutes I cried. I cried because I knew that meant I had to say goodbye to my happy place, friends and family. In that moment I knew we would be moving to Kenya. For me I feel like that is every area of my life...if I think I have it mastered then I'm just missing something. God taught me to always be looking to grow and learn more. Now that we have actually moved to Kenya, I'm going to tell you what the kids think. It has been a huge change (as we were already expecting it would be) and we are still adjusting to the changes of culture, people, food, and all that sort of stuff. But, we are having a great time here and everyone is really nice. Some of us might say a little too nice, they treat us like royalty and it took a little while for us to get them to let us help with anything. One of my favorite things here are the boda boda (dirt bike taxis) rides. The first time we rode on one I was pretty nervous. I just remembered all the times I had been told motorcycles were dangerous, even though boda bodas are much safer because they are slower and there isn't as much traffic except in the city. So I wasn't very excited. B and I were on the same boda boda, him in the middle between me and the driver. I told him that I was not about to be pressed up against someone I didn't know. Thankfully that has only happened once. When the boda boda started moving, I was holding onto Brendan so tightly I don't know how he wasn't complaining. Then I realized it wasn't so bad really. The only times I was nervous was when we were over bridges and when we rode through Bungoma, but I was watching the road the whole time to make sure the driver didn't hit anything! Near the end of the ride, B and I were showing off by sticking our hands out acting like we were airplanes and giving Karson high-fives. Mom said we were being foolish so we had to stop doing that. Speaking of Mom, her first boda boda ride was not so pleasant. She didn't want to go on one in the first place. She had Reed and Ava-Joy riding in front of her and they all almost got hit by a herd of cows. It has become a family joke now. Sometimes we are on boda bodas now and we see a cow on the road we yell at Mom saying, "They're out to get you!" Karson said his favorite thing about Kenya is probably the animals. So far the only 'exotic animals' we have seen are zebras and gazelles. We saw them on our way from Nairobi to Pastor Kennedy's house. Most of the animals we see here are cows, goats, pigs, and chickens. The other day, we visited a lady's house where she was raising rabbits. She had little baby bunnies that we held and fell in love with. When we asked her how much they were, she said 100 to 150 shillings. That is $1.00 to $1.50 each! We are planning on buying 5 or 6 of them. Daddy was teasing Mom, who loves bunnies, that he is going to name them Breakfast, Lunch, Snack, Dinner, and Dessert. Ava-Joy's favorite thing is playing with the girls. Mom and Dad got a hula-hoop from a store here called Nakumatt (which is pretty much a small Walmart) and the kids here love it. Joy will have the girls wait in a line and they will all show off their hula-hooping skills. Violet loved seeing the baby goats. When we were in Kaya visiting Mercy School the other day, Mom had mentioned seeing baby goats across the street. We decided to go see them. I thought it was funny that the family didn't mind seeing strangers walking across their yard. The baby goats were very tiny and so cute! We each took turns holding the two babies and kept asking Daddy if he could buy us some. He assured us we can get some after AFM Mercy Children's Home is built! Aspen recently made a new friend named Pastor Godfrey. Ever since we moved here, Pastor Kennedy has tried to get Aspen to like him by greeting her with hugs and "My friend, my friend. ", but she has not been impressed. Then we visited Pastor Godfrey's house and she immediately liked him. He held her once while speaking in front of his congregation and she will greet him before she greets Daddy. It is pretty cute. Reed agrees with me that the boda boda rides are really fun. He absolutely loves it! He will be riding between me and Ava-Joy and point out all of the cows saying, "Cow! They say moo." then he will fall asleep. It is sometimes difficult to keep him from falling off because he keeps leaning to look around. Several months ago, when we first got a sense of a "green light" from God on our move to Kenya, we had a February date in mind for our move. Well, as things have progressed, we are bumping up our move date to the first or second week of December. God willing, we will be in Kenya for Christmas! Our house is under contract! Please pray the closing is smooth and on-time. Passports have been applied for! Please pray they arrive on-time. Funding: While our move, land, and construction of the orphanage will be, God willing, covered from our personal assets, we are still in need of commitments totaling about $1,000/month for our orphanage costs. We are having a garage sale November 3-5 to sell off most of our belongings. Words cannot describe how blessed we feel to have people partnering with us through prayer and financial support. God bless each and every one of you. You mean so very much to us! Where have we been? Yikes time has gotten away from us. While I would love for this blog post to be all about how the house is sold, passports have been purchased and plane tickets are booked, I can't. Life has been full of hiccups over the last several weeks. I've had a constant reminder of just how "first world" our problems really are and had an even bigger drive to just get to Kenya already. I've found over the last several months that knowing the life God has called us to has made lots of struggles we have here just seem silly and less important. As many of you know we put our house on the market at the end of August. Our house is the only thing that we own that has any real value, so naturally it needs to be the first thing to go. I'm not a real estate guru by any means, but I don't think that the end of August was the best time to list a house. So here we are with a house listed that we know needs some work (mostly cosmetic), at not an ideal time and we have renters so that makes showings "tricky" at times. We are currently working on closing on our 4th offer. Obviously this hasn't been a smooth-sailing process, and while we are close to closing, it could also fall through. Over this last month I have processed many different emotions. I've gone from nervous to excited to let down to frustrated with moments of positivity. Please pray that the house sells now. In so many ways we are at a stand-still until it has been purchased. Our house in Garland. God willing, it will be sold this week. While dealing with the ups, downs and frustrations of selling a house, we had vehicle repairs to deal with. Basically, Jeff's car died. It was a 2000 Camry with over 250k miles, but we were really hoping it would work until January for us. I think we were asking a little much! After fixing it multiple times we decided to call it quits and move on. I think knowing that every dollar that was spent on that car was one less dollar going to Kenya made it an easy decision for us. Now if only the logistics of trying to run a family with one vehicle were that easy. Jeff drives a lot for work so it isn't an option for me to take him to work and keep the van. 5 days a week the kids and I are without a vehicle during the day. It actually hasn't been too difficult, but we are for sure planning more and being more intentional about errands and things that happen outside of our house. Good preparation for Kenya! Grocery shopping at 9pm on a Tuesday night. I'm a fixer...if there is a problem it comes natural to me to research, get a plan and make things work. So when the house isn't selling I go into "fix it mode". I start trying to find ways to make things work out better. When the car breaks down, I literally try, and often do, fix it. I usually hit up Google and youtube looking for parts and videos. Several years ago we had a laundry pile issue, one day laundry looked caught up, the next day it was overflowing. Then on pinterest I found the soulution to taming our laundy pile. Once Jeff built our new sorter and we put the new system in place it worked beautifully. Now 5 years later we still use it and it really makes life easier. For the last month or so I have been in plan and fix it mode and for most things I have a backup plan. :) I have lists upon list and backup plans for my backup plans. I feel like I constantly struggle with being still and knowing God has this and trying to fix things. While I know the house will sell in God's time and that the He will provide exactly what we need to move it is also hard. It is hard for Stephanie in the flesh not to question why the struggle. I like to feel like I'm doing my part, like I'm preparing our fields for rain, but it could also look like I'm trying to make things work according to my plan. The truth is this isn't my plan at all...my plan was to live here on our little farm, enjoy the peace that this move brought me and raise our "babies". So that busyness that is seen in me and that could look like I'm trying to force things to work in my favor is really me trying to do my part that I feel like God is calling me to do. My heart is to only cover my bases and plan best I can so that I'm not holding up stuff on our end, so I'm not standing in our way! Please pray for us! Pray the house will sell, pray that we won't grow weary of all the details, pray that we will see our "first world" problems as just that and please pray for funding. God is using many people to make this move possible and we are so grateful for those willing to join with us and help us get to His calling for our family. We hope to update everyone on where we are at financially soon! Eric Liddell was made famous to most of us by the movie that tells his story of Olympic gold and his love for God, Chariots of Fire. In the 1924 Olympics, Liddell refused to run in the heats for the 100 meters, the race he was favored to win Gold in, because they were on Sunday. He instead ran the 400 meters, a race he was not favored in and knew he had disadvantages due to his racing form. He ran right into history books winning gold with a personal story that shocked the world. The movie ends with these words placed in text on the screen: "Eric Liddell, missionary, died in occupied China at the end of World War II. All of Scotland mourned." The End. While the movie tells a good story about something Eric Liddell did, the last few words written on the screen at the end of the movie tell the real story of Eric Liddell. Though he was one of the most famous athletes of modern times and the Olympic glory of Scotland. Though he was a Christian who refused to compromise. Though without question, Eric Liddell was made to run. Yet more than anything else, Eric Liddell believed that "God made me for China." Here is where I can identify with Eric Liddell. While I've never been much of an athlete, I do know what it's like to feel that God has made me for a nation other than where I am from. For over three years now, I have not been able to shake the feeling that God made me for Africa. How can I love a continent that I have never lived in? God...that's how. Many years ago I began to have an unexplainable fondness of Africa. At the time, I had never been there. As a matter of fact, this past April was my first trip. But over the years, God has given me an undeniable love for Africa and the people who live there. In my recent trip to Kenya, I could not shake the feeling that this was to be home. At least as home as any place in this life can be. The last several weeks, very little has worked out according to our plans. We are selling our house in order to raise most the money needed to purchase the land in Kenya and build Mercy Children's Home. This is where our family will live and also raise and disciple as many orphans as God will allow. Initially we are planning for room for 80 orphans. However, selling our home is taking much longer than we expected. We have also been experiencing several issues with our 16 year-old car that has 250k miles on it. (I know, imagine that...haha) We just need it for about 4 more months, but these repairs have been getting pretty expensive. We have also been passing around some sort of respiratory illness. It especially has hit Steph and I pretty hard for a couple weeks. In all this, I realize if we are going to praise God in the good times, we must praise Him in these rough times. We must count it all joy, knowing that God is producing steadfastness in us. (James 1:3) And regardless of whether or not our move to Africa goes according to our plans and whether or not the funds come according to the way we plan, we are moving to Kenya. We have no doubt that this is God's plan for us. We know there is no wisdom, no insight, no plan that can succeed against the Lord (Proverbs 21:30). We trust that God will work out the details according to His plan. We trust that God will provide according to His purposes. We can do nothing else but go, because God made me for Africa. Anyways, I did know that NO plan can succeed against the Lord, I really did. But later that day it hit me. It was like a "duh moment" if you will. The full impact of that verse kept washing over me, almost in waves. In some sort of way this verse became my mantra...it has been stuck on repeat in my head since then. Every time I hit a road block big or small "There is no wisdom, no insight, no plan that can succeed against the Lord. ", runs through my head. Shortly after my "poor me fest" I was working on Jeff's car again (that is a whole different blog post all together ;)...the bolt I was trying to get off was so STUCK! This bolt probably hadn't been removed since it was put on the car 16 years ago, so here I am, way in over my head feeling like I can't do it, but knowing I need to and there it is, "There is no wisdom, no insight, no plan that can succeed against the Lord"...and I kid you not, as I'm trying with all my might the bolt loosens...I, with God's help, was able to get that bolt off. Probably sounds dumb to some of you that I think big ol' God cared about me getting this bolt off. But I just know He did. He cares about the big and small things! A few days after this we found out that our house wouldn't be bought by the couple who had been working towards buying it for the last 4 months. So here I am again with all sorts of thoughts going through my head, and feeling the panic set it. We do need to pay for the land in Kenya, we do need to have thousands of bricks made, we do need to be making progress in our move to Kenya, but can't until the house sells. But then God steps in, "There is no wisdom, no insight, no plan that can succeed against the Lord. "...He's right! God has this, He does. So why do I continue to stress about it? Even Reed tried to help me get that bolt off! So here we are about a week out from all of this and we have a car that works, we have a house that is listed for sale, we have great friends and amazing kids. And just like Jeff said to me "There is no wisdom, no insight, no plan that can succeed against the LORD." The house will sell, the land in Kenya will be bought, an amazing home for us and many others will be built, STORIES WILL BE CHANGED, mine probably the most. Jeff and I frequently get asked the question of how often we will be back in the states for a visit or how often we will be coming home for furloughs. I wanted to pop on here real quick and explain how we see things going as of now. Just like the "sudden" call to move to Africa (more on that here) , God can do and does exactly what He wants when He wants ;). We will continue to follow Him should He call us back to the US at some point. But for now, the reality is that visits will be few and far between; very far between. Travel from Kenya to the US takes about 2 full days; a hotel stay (well, we are choosing that for the move) and at least 2 planes, but more likely 3. Plus a 7 hour drive to Kaya after arriving in Nairobi. Getting 9 people to an airport, on a plane, off a plane, on a plane, off a plane, grabbing 20 something bags and to a hotel will be no easy feat, nor will it be cheap. We aren't moving to Kenya with a large missionary group backing us. AFM (About-Face Missions) is a small international ministry connecting Christians with global indigenous pastors assisting and supporting these servants in their God-given missions to carry out the Great Commission and serve the needy. AFM was founded in 2011 by Jim Ball and David Shelton. Jim is now a full-time missionary evangelizing unreached people groups. David is now serving as AFM President and Director. AFM is ran by an all-volunteer staff of seven folks from various locations in the US. We are a 501c3 so all donations made to AFM on our behalf or the behalf of any of our other supported ministries are tax deductible. We will be the first missionaries sent into the field by AFM. So while we will be supported by donnors we won't have thousands of extra dollars to be flying in for visits...not even every third year. Pictured above areLinda and Ann, 2 of the orphans living with AFM supported Pastor Samson and his wife Ruth in Moi's Bridge, Kenya. Coming back home...Well, Kenya will be our new home. We are leaving Texas and building our new home and life in Kenya. Kenya isn't just a 5 or 10 year move for us, this is where Jeff and I plan to grow old together. God willing, this is where we plan to continue to raise and possibly grow our family. Our main purpose in Kenya will be to care for orphans and widows, discipling all whom God will allow. It is our desire, God willing, to be a blessing to the community in which He is placing us. While we will have help with the children's home, we do not have plans to turn it over to someone else anytime soon, so that will make leaving for an extended period of time hard. The kids...We've been very honest with them about our move and the likelihood of us not returning. We've told them that we won't be able to come back often, so if you ask them when we are coming back they will probably just say they don't know. Just know that's not because we haven't discussed it, it is literally because we don't know if or when we will be back in Texas. We tend to over prepare/inform our children for things if that is possible, that's just part of the way we have chosen to parent. We like for them to know what they are committing to before they just jump in head first. A quick example is Caitie desperately wanted to go with Jeff to Kenya back in April. However she was very sad when we told her we (and by we I mean mainly me) wanted her to wait until Jeff had been so he could help prepare her for the unknown of another country. My "Momma gut" kept telling me that Jeff needed to go first so he could help prepare her. Obviously she disagreed, but ultimately she understood and trusted us. Well you should have seen the look on her face after her Daddy came back and told us the "bathrooms" there were literally a HOLE in the GROUND. I thought she was going to burst. She would NOT have been okay with that at all and that isn't something that her Daddy could have easily explained to her in the moment. Pictured above: Left, the two dark brown structures are Toilets at AFM Mercy School. Right, Urinals at AFM Mercy School. As far as our 3 adult kids, we are so hoping that they will come and visit us. They have each said they will come and visit...my heart just might burst if we are ever all in Kenya together. Leaving our "big boys" as I call them will most definitely be the hardest part. I literally can't talk (or even type for that matter) about it without crying...it feels so wrong. But at the same time I KNOW that we have been called to this. I keep thinking of all the things we are going to miss or what we might miss or "what ifs". Two of our boys are graduating in May of 2017; one from high school and one from Princeton Theological Seminary. While I keep telling myself that it is "just a ceremony" and we have been there for them for this whole "school career" it is heart-breaking to know that we will miss these important life events and many others. Our supreme affections belong to the Lord. We have no doubt that this move is of Him. While leaving behind our "big boys" will be a difficult trial to our entire family, we count it all joy, giving God all glory and honor and praise. Will we ever see you again? I don't know the answer to that, but we hope so. I can tell you that we will have a room for you (even enough room for a group of people). You, yes you, are invited to come and see what God is doing in Kenya! I've always heard that mission trips were expensive...like $3000 or more. Well, not here. We are purposefully building a room for guests. If you are able to come and stay with us all you will need to do is get here...I mean there...Kenya, get yourself to Kenya. We will feed and house you for as long as you can stay. A quick Google search will show you that you can get a round trip ticket for around $800, and I bet if you have some sort of flyer points you can use those to make it cheaper or possibly free. Yesterday I even saw some one way flights for under $600, and for us, that is exciting! Also if you want to see us while we are still here in Texas, let one of us know and let's make it happen! Life is busy, I completely understand that. But we would love to see our friends and family before we go, even if it has been too long since we saw you last. If you want to come to the farm let me know and I can throw lunch or dinner together and we can visit. This move has forced me to adult and actually have a calendar/planner. Can you even believe that I've made it this long just winging life ;)? So let Jeff or I know if we can write you down and visit (at our house or yours) for a while before we move in February! Pictured Above: My First Adult Planner!!! Thank you so much for taking the time to read this and pray for us. Your prayers are felt and are sincerely needed.